Harrogate Town must negotiate a 420-mile round trip to Essex on Tuesday evening if they are to progress to the quarter-finals of the FA Trophy. Simon Weaver’s side were held to a 2-2 draw by Isthmian Premier Division leaders Billericay Town at the CNG Stadium in Saturday’s third round clash, meaning that the sides have to do it all over again in a replay. Town fell behind after 10 minutes, but drew level within 60 seconds courtesy of a stunning Joe Leesley strike. The same player then netted for a second time to give the hosts the lead, but Billericay hit back to tie things up with 20 minutes remaining. 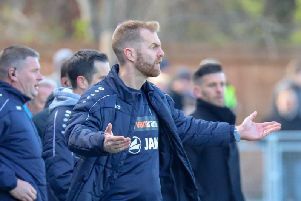 “I’m confident that we can go and get a result at Billericay because I believe in the lads and we’ve not lost many this season,” boss Weaver said of Tuesday’s game. The winners of Tuesday’s replay will play host to Wealdstone, currently 12th in National League South, in the quarter-finals of the competition on February 24. The third round of the Trophy is the furthest that Town have ever progressed in the competition since entering it for the first time in 1974.